Bella Vista doesn't have it's own school system. We fall into two separate school districts with some students going to the Bentonville school system and others to the Gravette school system. In 2007 Bella Vista's "first school", Cooper Elementary, was open for business. 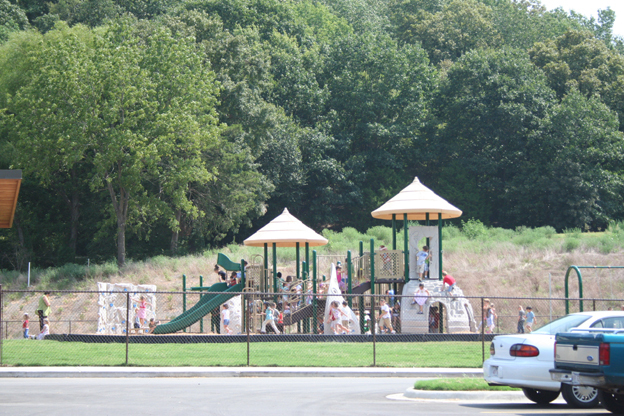 Not having it's own independent school system, Cooper Elementary is part of the Bentonville School District. If the design of the school looks a bit "barn" like there's a good reason for this. Cooper elementary did replace a noted Bella Vista landmark. The school was built where the old Knox barn which, for years housed the Bella Vista Riding Stables, has stood for more then half a century. Now, rather then housing livestock, over 500 children a year are in the same spot, learning about farms, livestock, and many other wondrous things! John and Mildred Cooper would be proud. helped to bring about the demise of the old Knox Farm barn. A site off of Lanshire Blvd on the west side of Bella Vista has been chosen for the 2nd elementary to be built in Bella Vista. It will be in the Gravette school district, however, no time table has been advanced for the building of the school as of yet.